I went to the pool… four times. I got on the bike… twice. I went to Mere Mortals… once. The day before the tri I was set up to do a brick – basically a run through of the tri. Nothing like waiting till the last minute, right? Kinda like cramming for finals after you have goofed off all semester… yyyeeeaahhhh that was me. We were going to meet at the swim school, do laps, then get out and run to our bikes, then go for a run. That was the plan. Mother Nature had other plans when a thunderstorm blew in out of no where. So instead I loaded the car, and went to bed early. The next morning I got up at 4am to head to the beach. The morning was perfect – calm water, calm wind, not too hot. Absolutely perfect. I pulled in to the parking lot just as some of my other Sweat Sisterz arrived. The nervous excitement was palpable. We got our transition areas all set up, took a million pictures, high-fived about a million times, riled each other up, and before long it was time to head to the beach. Within 10 seconds of starting the swim – I was kicked in the face. Not hard – but it was a kick for sure. That was my fear all along, so as soon as it happened… I busted out laughing. People around me must have thought I had gone mad – but I proceeded to quickly doggy paddle to the outside – where I would not get kicked – and get back to swimming. It sucked. Although the water was calm, the current was strong, however I came out of the water still laughing. Next was the bike – I took off easily and began riding towards the Boardwalk. I knew my gears were wrong – I was pedaling way more than I needed to be and not going very far. But I kept clicking away and nothing changed, so I just settled in for the ride. I was excited to finally get to say “on the left” which is what you have to say when you are passing people. (I learned that at Mere Mortals when I heard it about 100 times as people flew past me.) I nearly high-fived the guys at the turn around point – I was cruisin. I looked down at my time, celebrated a little bit – and sped up. I saw the end and began celebrating even more – singing the Rocky theme in my head, feeling amazing and ready to crush the run and be done. I got back to the area where I started, but instead of motioning me to turn in – they waved for me to keep going. Wait – what? Turned out we had more to go… a lot more to go. I should have known it would not be that easy. But I pedaled on. The Rocky theme would have to wait. When the biking was finally over, my legs felt like I head lead shoes on. So I walked. In fact I walked a good bit of it. My friend Andrea was also walking – so we walked together – laughing and talking. We cheered on the bikers still on the course and high-fived the runners as they passed us heading for the finish line. We finally got to the water station that marked the half way point – and I am pretty sure that water came directly from a stream in Heaven – it was absolutely delicious. I began walking back, but wanted to finish strong, so I dug deep and began doing intervals. When I hit the entrance I told myself I would not stop running until I hit the finish line. I sprinted through the parking area and over the finish line – nearly barreling over Amy who was handing out the medals. For the next hour or so we all just celebrated. After months of anticipation and talking about it – well, and other people training LOL – it was done. 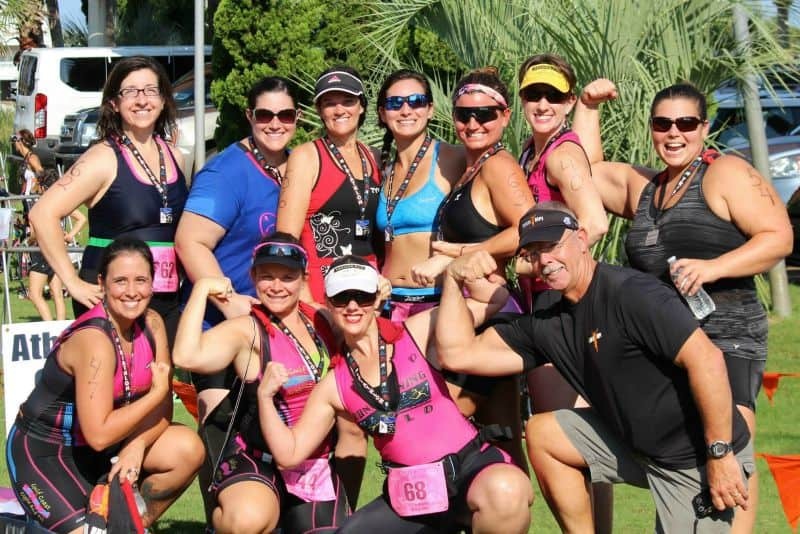 We all crossed that finish line one by one – and became triathletes. It was an amazing moment for every one of us. We were all so thankful that Amy got us all triathlon medals – it means so much to get that little medal after completing your first tri. There were lots of laughs, lots of hugs, and even a few ugly cries. But I was proud to not only have finished this event – but to have done so with some of the most amazing women in the world. Since the tri I have focused on my running – PR’ing a 5k last weekend for the Run Now, Wine Later virtual event with a time of 38:01 – a time literally seven minutes faster than any of the other 5ks I have done. Since I expected the run to be the hardest part, it was really the only part I “trained” for – and somewhere along the line I completely fell in love with it again. My bike and swim cap have been safely tucked away for now, and my medal hangs proudly in my bedroom. I have no plans to do another tri – except maybe this same event again next year to beat my time. Even though I did not properly train for this event, it still feels amazing to know that I completed it. 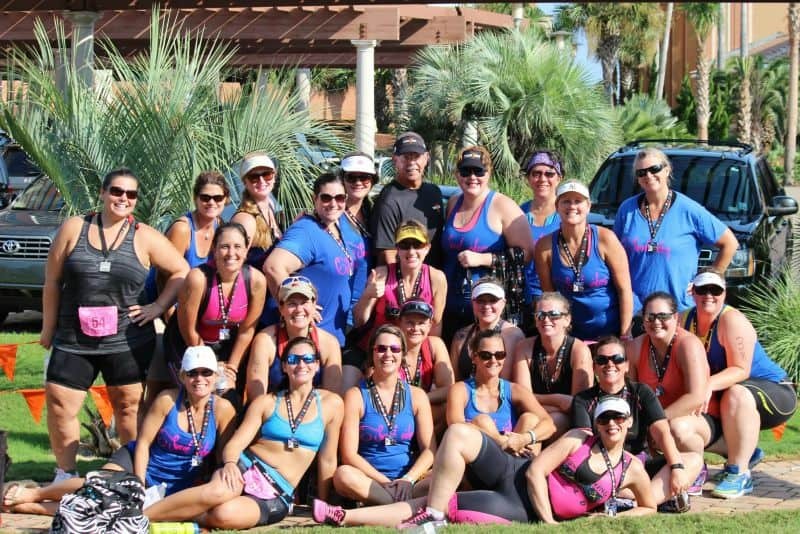 Thank you to Team MPI, Portofino, Gulf Coast Cycle and Tri, my SweatSisterz, and everyone else who made this day just absolutely perfect! You are a rock star! You should be so proud of yourself – you are amazing. ** tosses confetti in the air** Congratulation on pushing yourself and completing you first triathlon! I have heard that they can be rather addicting. We just started running a couple of days ago and it’s a lot harder than I thought. We go 2K ( running 2 min. then walking 1 min} and it’s super hard to motivate myself to get out there. I would love to do a 1/2 marathon one day. Congrats! I can’t even imagine doing a triathlon, but I bet it felt incredible doing it. The closest I have ever done was a 5k, and though I was exhausted afterwards I was so proud that I did it! Congrats! I love doing the 5K Mud Run where I use to live, but now we are in a small town 8 hours away so there are no runs hardly, or if there are they are not ones id want to do. This looks hard but fun! I can’t swim to save my life so I would not do good. I doggy paddle too lol. Wow Wow Wow!!! Way to go! I am so impressed…you are a rockstar! That is amazing! I don’t even know if seven months would be enough time for me to prepare. I can’t wait to see you attack the next goal. Congrats on completing your first triathlon and succeeding! What a great accomplishment. Huge congratulations, what a big accomplishment! I’m running my first 5k next Friday (nothing compared to what you just did), and I’m a littler nervous! You’re a total inspiration that we can do anything that we set our mind to though. Congrats! That’s awesome! And what a sense of accomplishment you must feel. OMG You’e my shero. Congrats on completing your first triathlon, here is to many more accomplishment.